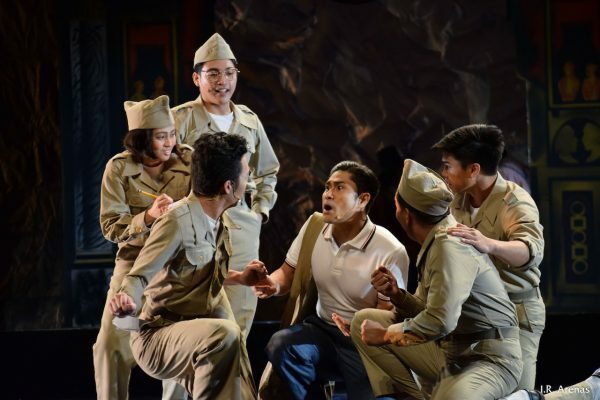 The incarnation of Pat Valera’s “Mula sa Buwan” currently running at the Hyundai Hall of Arete in Ateneo might be its strongest version yet, with an improved set and three well-matched leading performances that has elevated the romantic wartime sarswela. This reimagining of Edmond Rostand’s Cyrano de Bergerac takes the characters to Manila in the 40s. 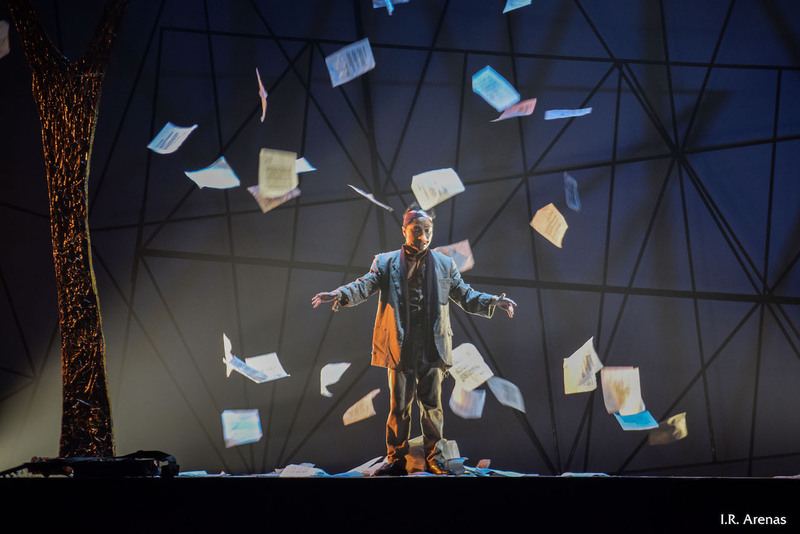 Ohm David’s set is textured with crumpled backdrops and pieces that calls back to the moon’s crater. War is on the brink but the youth have not lost their happy-go-lucky nature. Cyrano (Nicco Manalo) is the epitome of this disposition, spending his days play-acting with his band of merry men, hanging out at the local watering hole, nursing a crush on his best friend. He also has an abnormally long nose, the subject of many musical numbers in the beginning. The show starts slow, despite the big high-energy numbers in the beginning. Dawdling too long on Cyrano’s nose, and bogged down by histrionics of an ensemble that don’t quite match up to the leads. Soc Rodrigo’s translation of the source material is at its most poetic here, but also at its most esoteric. The musical hits is stride when the love story finally kicks into gear. Manalo, in a state of happy dreaming sings the show’s most iconic ballad, “Ikaw”, (music and lyrics by William Manzano) about an oblivious Roxane (Gab Pangilinan) as she whimsically walked along. It’s the start of a love triangle, where the best friend as the unrequited lover watches as the love of his life fall for the strapping newcomer, Christian (Myke Salomon). There’s a farcical approach to this romance in the beginning, a cheerful ruse where Cyrano conspires with Christian to woo the smitten Roxane. Cyrano’s wit is as sharp as his nose, you see, and Christian isn’t as smart as he is handsome. Together, they form the complete package of brains and braun and succeed so well that the night’s courtship ends in a sudden wedding. “Mula Sa Buwan” is an exploration of youth, revolution, and romance at a time of devastation and change, but shines brightest as a love story, even with its ridiculous premise. It’s in the performances, you see. Salomon is a charismatic leading man; his Christian has a sober self-awareness to him, and a playful comedic sense that’s incredibly entertaining to watch. Pangilinan, for her part, possesses Maria Clara’s charm and Gabriela Silang’s conviction, making Roxane an obvious object for many a men’s affections. 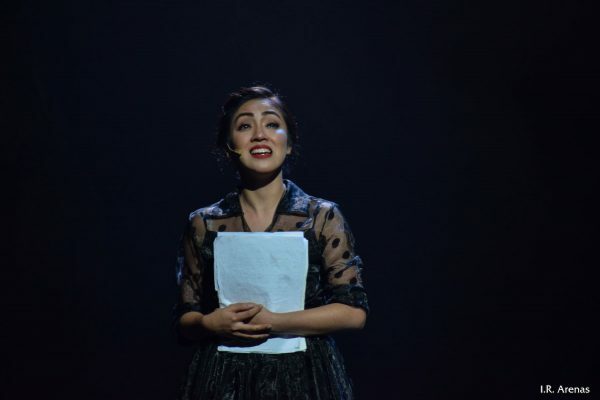 In the second act’s 11 o’clock number, she is center stage for the show’s emotional climax, performing “Ang Sabi Nila” with astounding grief that is just the highlight of the show. Manalo shows himself the true star of these proceedings, however, with a detailed performance demonstrating how well he has a handle on his character from start to finish. His Cyrano is magnanimous, with performative arrogance but selfless romanticism that is pitch perfect for this period piece. He plays so well the unrequited lover that he has solely captured the audience’s empathy. His abject longing for Roxane ensured that most of his scenes were punctuated by sounds from a titillated audience. Noteworthy performers also include Jon Abella (with a stage presence that draws you to him when he’s on stage) as Cyrano’s best friend. and Phi Palmos—rocking a purple pantsuit like nobody’s business—as Rosanna. Palmos added a certain zest to this character traditionally played by a female actor, but his casting diluted the supposed romantic undercurrent between Rosanna and Cyrano that it easily went over people’s heads (this writer included). That the role in all its flamboyance is performed by a man had no narrative impact and served the singular purpose of representation. This step forward in LGBT representation is undermined somewhat by a main female lead whose sole preoccupation were the men pursuing her, who was essentially deceived and manipulated to marrying someone she thought she knew, and allowed to mourn the wrong man for years by her closest friend. There’s nothing romantic about a woman bamboozled into marriage and widowhood, but such is the strength of the leads’ performances that you want to root for them regardless. 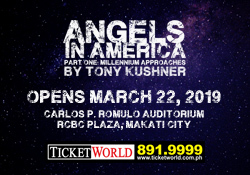 An old-timey love story set to beautiful music that harkens back to kundimans of old? It’s no wonder the millennials are coming in droves.